Are we at the halfway point already? A nine-month wait between seasons will be cruel, but nowhere near as cruel as the six-year wait between the last book and the upcoming one. This was an interesting episode, as it featured a lot of conversations that did not appear in the books... but they were all very good scenes that built up minor characters and provided backstory that would have been hard to squeeze in otherwise. Varys, Littlefinger, Renly Baratheon, Ser Loras, and Theon Greyjoy all got moments to shine. Renly isn't anything like I the character that I pictured, although I'm not writing that off as a bad thing at this point.. adding in a relationship between him and Ser Loras was an unexpected move. But one new scene here actually improved on the book: the conversation between King Robert and Cersei. The book never really explored their relationship the way this scene did. Seeing the feelings of pain and resentment that they hold toward their marriage added a whole new depth to what was portrayed as little more than a marriage of convenience in the book. No Jon Snow or Daenerys this episode... I'm curious to see how they will try to stretch Daenerys story over the seasons, as she is emerging as one of the more popular characters but has relatively little narrative. So far, they're not doing bad at creating new scenes, as far as I'm concerned. The last thing I want to mention is Tyrion, captured and brought to the Eyrie. Lysa Tully and her son, Robert Arryn, are every bit as creepy as they imagined. Not quite as creepy was the sky cell. In my mind, I pictured that to be a much smaller cell, where I'd be afraid to sleep for fear of rolling over into a free fall. In the cell brought to the screen, I could get much further away from the edge... although I'm sure it still wouldn't be enough. I hate that time between seasons. That's why i devote my time to seeing long running (or even already ended) series. Anyone that hasn't read the books might think this spoiler-ish. Renly & Loras - yeah, they were presumably gay in the book, but the whole shaving scene was freakin' bizarre & I'm not sure what the hell the conversation between them is supposed to be leading up to. Blame Loras for making Renly defy Stannis? Um, okay. Cersei & Robert - the novels painted a pretty clear picture of Cersei as a nutty woman who just likes screwing her brother (literally & figuratively) & thinks she's the cleverest crayon in the box. Robert is a drunken brawler past his prime. They never had a romance. I feel like the show's writers want her to be more sympathetic than the novels. Ack, forgot to mention I so agree about the sky cells! 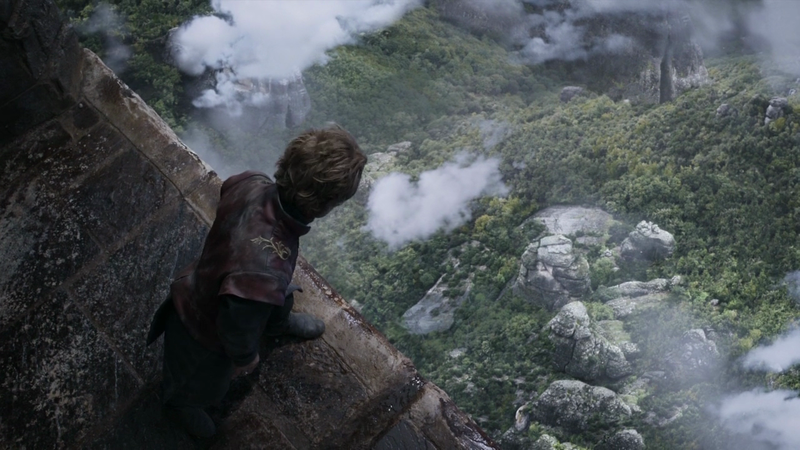 I remember a scene where Tyrion wakes up looking over the edge & nearly falls off! In the large one on the show, he (or a normal sized person) could simply sleep with his feet pointing towards the open wall & be fine.